As authoritative as a steel-colored sea during a storm, the new Ulysse Nardin Black Sea Chronograph offers a commanding presence and the unfaltering reliability expected from master diver watchmakers. 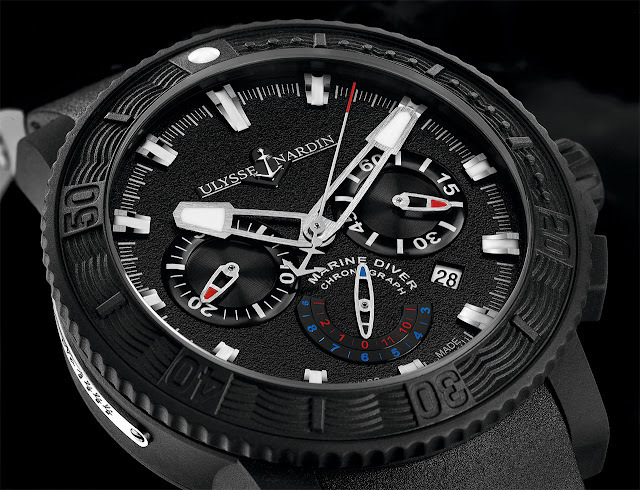 Below the water’s surface or on solid ground, this timepiece guides its wearers with exacting precision and endurance. Steering divers to depths of 200 meters and sporting a rubberized screw crown for added water-resistance, the Black Sea Chronograph features Superluminova on the dial for sharp, luminescent visibility in the darkest of places. Another beneficial component is the unidirectional turning bezel. Enhancing its ability to withstand the most challenging environments are the materials from which it is constructed. Its 45.8 mm diameter case is made from stainless steel coated with rubber and finished with a sapphire glass case back. Its buckle, as well as other segments of the watch, is crafted from ceramic, while its rubber strap brings comfort and flexibility. Black Sea Chronograph also presents a special personalized chronograph seconds hand adorned with the iconic Ulysse Nardin anchor. The permanent seconds indicator is at the 3 o’clock position, while 9 o’clock marks the 30 minutes counter. The date is located at 4 o’clock, and 6 o’clock indicates a 12-hour counter detailed with a red and blue hand. Rubberized pushers offer ease when a hurried start or stop function is necessary. Complementing its functionality and strength is its styling. Monochromatic in rich black with accents of blue and red, Black Sea Chronograph is masculine, as it is elegant. It is the ideal timepiece to accompany the bespoke and diving suit, alike. 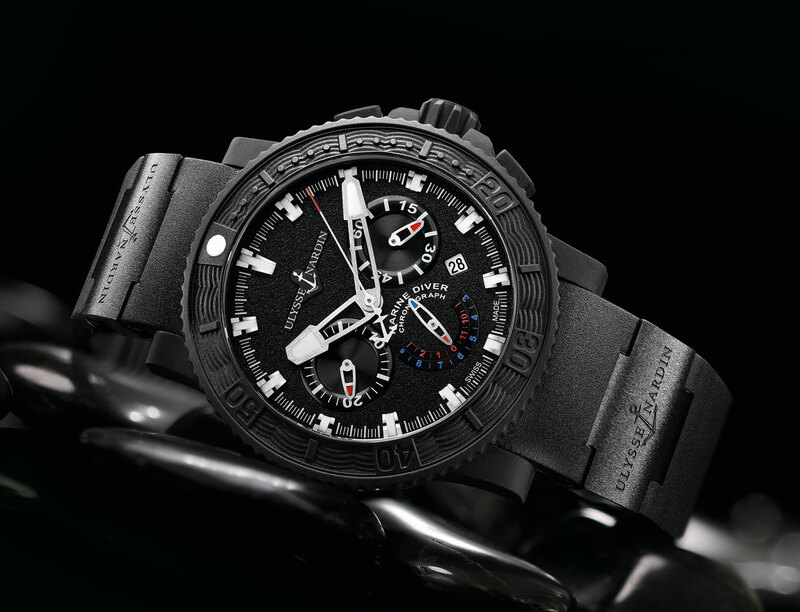 Black Sea Chronograph is for the man who counts the hours before he can return to the sea.